Scott # 4377. Unaddressed, handpainted Queensbury unofficial FDOI FDC. Lundquist artwork. Scott # 4389. Collins F4601. 2009 Obama/Biden Inauguration event cover. Handpainted Queensbury Card. Lundquist artwork. Barack Obama 2009 Inauguration - Handpainted Queensbury Card. Lundquist artwork. Scott #'s 4424 & 4427. COMBO FDC. Scott #4666. Hand painted Barnes-Lundquist artwork. Scott # 4695. Hand painted Queensbury FDC. Barnes-Lundquist artwork. Scott # 4696. 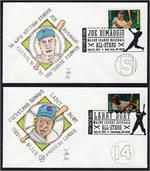 Hand painted Queensbury FDC. Barnes-Lundquist artwork. Handpainted Queensbury event cover. 150th Anniversary of the Civil War Battle Of Antietam or Sharpsburg. Barnes-Lundquist artwork. 2012 Civil War Battle Of Antietam 150th - Queensbury H/P..
Civil war event cover. 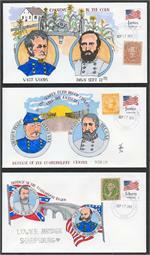 150th anniversary of battle of antietam/sharpsburg with CSA 1935 reprint pair affixed. handpainted queensbury barnes-lundquist artwork. Handpainted Queensbury set of 3 different event covers. Phases of the 150th Anniversary of the Civil War Battle Of Antietam or Sharpsburg. Barnes-Lundquist artwork. With 1935 CSA reprints.